Below the bridge, flat-bottomed boats are ferrying people across the Nishiki River, just as they did centuries ago — back when commoners were not permitted to walk over its wooden arches, and even centuries before that, when there was no bridge at all. The long wooden craft glide with hypnotic languor as boatmen punt them across the water. We’re standing on Kintaikyo Bridge in Iwakuni, Yamaguchi Prefecture — one of the Nihon Sanmeikyo (Three Famous Bridges of Japan). 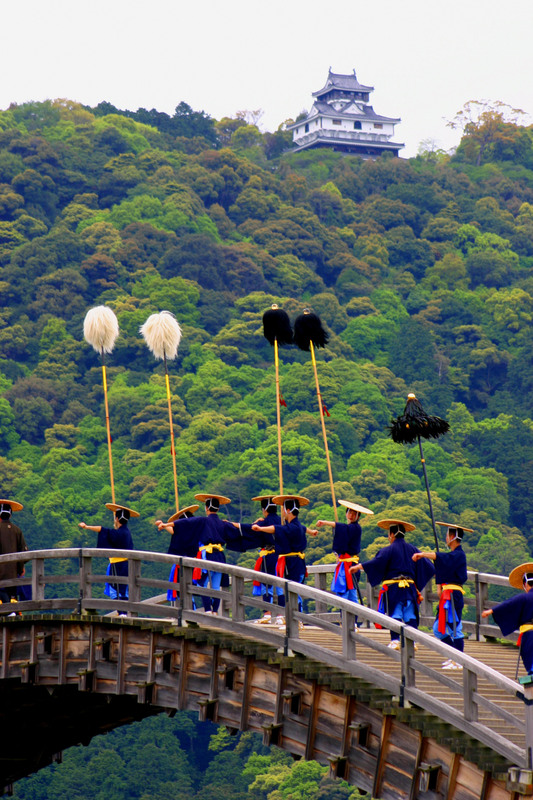 So proud are the Iwakuni residents of the bridge, they set aside April 29 (a public holiday for the birthday of Emperor Showa) as a day to celebrate it. And that is why my wife and I are here — us two and 40,000 other people. Why is the bridge so revered? Well, it’s obviously beautiful and, with its five elegant wooden arches (originally built without a single nail) supported by three stout stone piers, it’s an engineering marvel, too. But to grasp the full story you have to go back more than 400 years when Hiroie Kikkawa (a man who would become Lord of Iwakuni), had just been defeated in the Battle of Sekigahara in 1600. 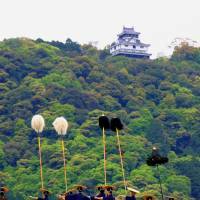 Banished to Iwakuni from his castle in Izumo, Kikkawa went looking for a place to build a new castle and eventually selected a site on Mount Shiroyama, by the banks of the Nishiki River, using a bend in the river as a kind of moat. He instructed upper-class samurai to build their residences on the castle side of the river, while lower-ranking samurai and merchants were to live on the other side. Iwakuni grew up as a town divided in two by its river. And so it remains today. Entering the castle side is like stepping back into old Japan, with the grounds of the Kikkawa family’s former residence now turned into Kikko Park. This public space features a number of attractions, including museums, fountains, samurai houses, the Kikkawa family shrine (1884) and Momiji Dani Park, created from several former temple gardens, and nicknamed the “Kamakura of Western Japan.” Kikko Park is also home to the famous White Snake Viewing Facility. Unique to Iwakuni, these cute creatures are a Natural Treasure and considered messengers of Benzaiten, the Buddhist goddess of good fortune, love, luck and eloquence. 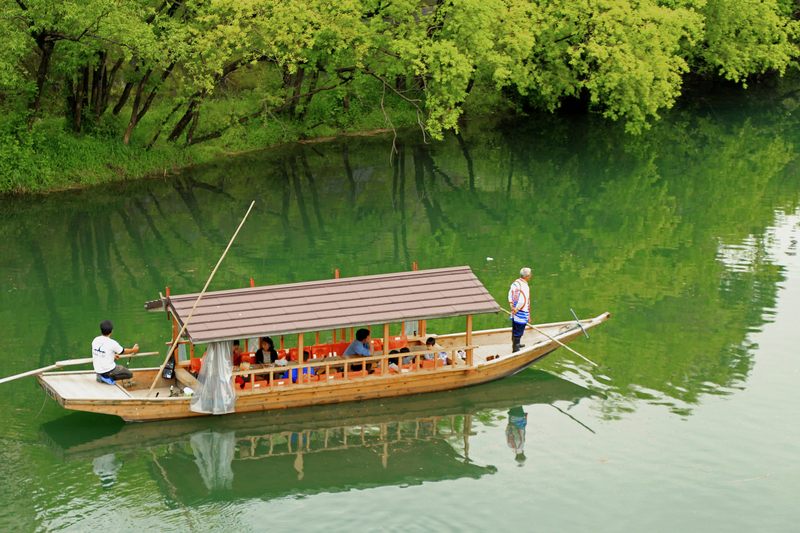 In the days before the bridge, getting from the castle side of town to the commoner’s quarters would require a ride across the Nishiki River in a small boat. Clearly, a bridge between the two sides was needed, but the river is notoriously prone to flooding and all early attempts at bridge-building were washed away. That’s where Hiroyoshi Kikkawa, third Lord of Iwakuni, comes in. “I want to build a bridge that will never be swept away,” he declared (according to a brochure entitled “Iwakuni: Living Traditions in a Castle Town”). He decided a bridge needed to be designed with either very strong piers or no piers at all. 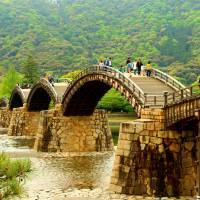 Eventually, he decided on the former and the first Kintaikyo Bridge was completed in 1673. Sadly, storms demolished the wooden structure before it was even one year old, but Kikkawa had a replacement built with strengthened abutments in 1674. This time, it lasted for 276 years, until Sept. 14, 1950, when tragedy struck the bridge in the form of Typhoon Kijiya. The townspeople rallied to save their beloved Kintaikyo, laboring all night to divert water from the bridge using 1.8-meter-long barrels while chanting “Protect the bridge!” But at 9.40 a.m., they could only watch helplessly as the third pier cracked and the third and fourth arches were swept away, along with their dream of having the bridge declared a National Treasure. One week later — in response to the impassioned pleas of the local populace — plans were already underway for a new bridge. Some lawmakers in Tokyo dared to suggest replacing it with a concrete version but, for Iwakuni, that would be like replacing the Eiffel Tower with a multi-story parking lot. The will of the people prevailed and in January 1953, after two years of work, the third iteration of Kintaikyo Bridge was opened. Forty years later, it was finally declared a National Treasure. In 2002, the first renovations in 50 years were undertaken. The work was completed on Mar. 20, 2004, but the following year the bridge again suffered extensive typhoon-damage when record rainfalls deluged the area. 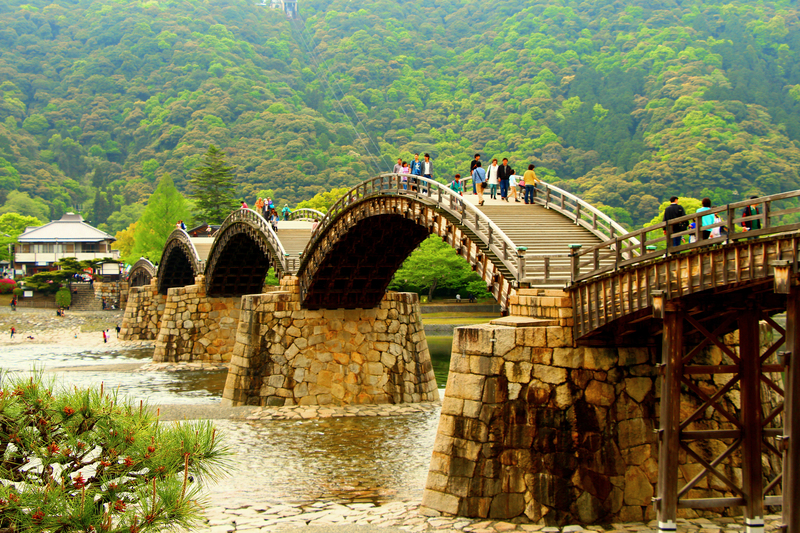 The present bridge is the Kintaikyo’s fourth incarnation. 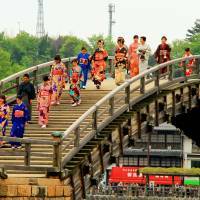 Back at the festival, the day’s main event is about to begin: a reenactment, in full period costume, of a daimyo’s (feudal lord) procession over the bridge. The portentous thunder of giant taiko drums roars up from the riverbank like an approaching tempest. Then, men appear from over the hump of the bridge’s central arch, brandishing enormous banners and long poles with fluffy pom-poms on the end. More follow: wave after colorful wave, carrying flags, banging drums, clanging cymbals, chanting, lugging great tansu (wooden chests) and hurling 10-foot-tall staffs through the air from one man to another. 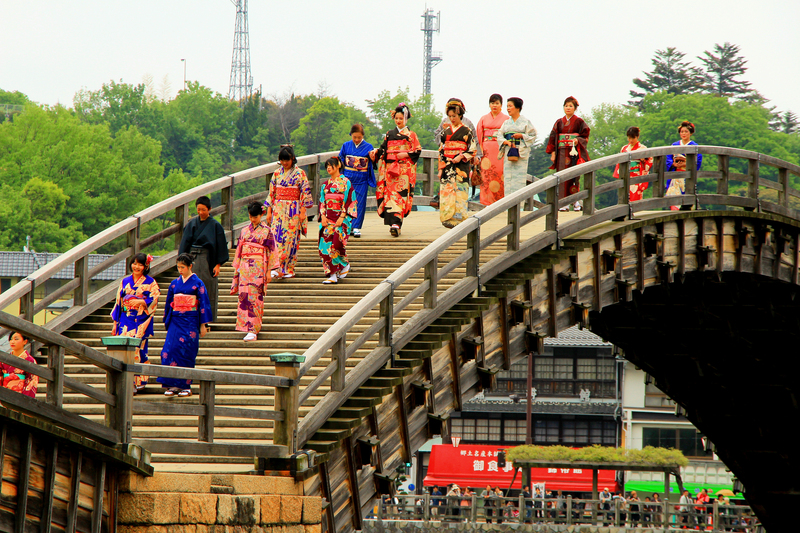 Servants, priests, courtiers and soldiers — some with samurai swords, some with ornate long bows and arrows, others wearing golden coats — come half-marching, half-dancing across the bridge. These characters pass at a leisurely pace, as though we’re watching a noh play — another of today’s many lessons in the virtues of slowness. After nearly an hour come the daimyo and his lady, along with her ladies-in-waiting, wearing gorgeous kimono, bringing the procession to an end. It reminds me of a scene from the “Fifty-Three Stations of the Tokaido,” a series of woodblock prints from the late 1800s by ukiyo-e artist Utagawa Hiroshige. Then, at last, it’s our chance to cross. For 195 years, only the daimyo and his vassals were permitted to cross the bridge — lesser mortals had to make do with the flat-bottomed boats to ferry them across. It wasn’t until 1868 that all citizens were permitted to use it. These days, for a toll of ¥300, anyone can have the experience, though it still feels like a privilege to set foot on such an amazing structure. Like the daimyo’s entourage, my wife Angeles and I take our time to cross, lingering over each mindful moment, savoring the up-and-down curves of the bridge’s arches, the steep steps, the forested hillsides all around, and the Nishiki River, swooshing over the stony riverbed below us (after all, this is iwa–kuni, which literally translates as “rock country”). A sudden volley of arquebus fire makes people jump. We reach the other side just in time to see the shooting display by the men and women of the Iwakuni musket troop, in full samurai battle dress. Loading the old guns is a complex process and takes a while (like everything else today), but when the splendidly attired commander gives the order to fire, there’s a loud collective cracking sound and the whole troop disappears in a dense cloud of smoke. When it clears, I look around and, for a moment, see absolutely nothing to suggest we’re in the 21st century. The Iwakuni musket troop practices once a month here along the riverbank. Like the bridge engineers, their aim is to preserve Iwakuni’s cultural heritage, in particular the gunnery style of Mitsunari Ishida, commander of the western army in the Battle of Sekigahara. Afterwards, the merry musketeers are happy to pose for photos. One of them proffers his musket for us to hold. “These were used in Japan more than 300 years ago,” he tells us. As we say goodbye, I go to shake his hand, but he just smiles and shows me his palm: It’s completely black from burnt gunpowder. To round off the day we go in search of Iwakuni’s renowned layered sushi. A volunteer guide directs us to the Hangetsu-an Ryokan, a hotel dating from 1869, located down the road from the bridge. In front of the hotel is a gorgeously wabi–sabi (rustic) little garden with mossy stone lanterns, maple trees and a koi pond. A lady in a pink kimono sees us admiring the fish. 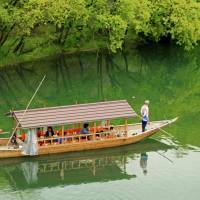 Getting there: There are daily flights between Tokyo and Iwakuni Kintaikyo Airport. Iwakuni is also roughly 1.5 hours away from Hiroshima by train. For more information, visit www.city.iwakuni.lg.jp.